Cindy: (more)…This would make a great classroom read aloud as a springboard to research on Robert Miller or the many topics in the sidebars. You could also pair it with the Eiffel Tower chapter in There Goes the Neighborhood: Ten Buildings People Love to Hate (2001) by Susan Goldman Rubin. I’m definitely adding it to my Fun Nonfiction booktalk bibliography. There’s more! 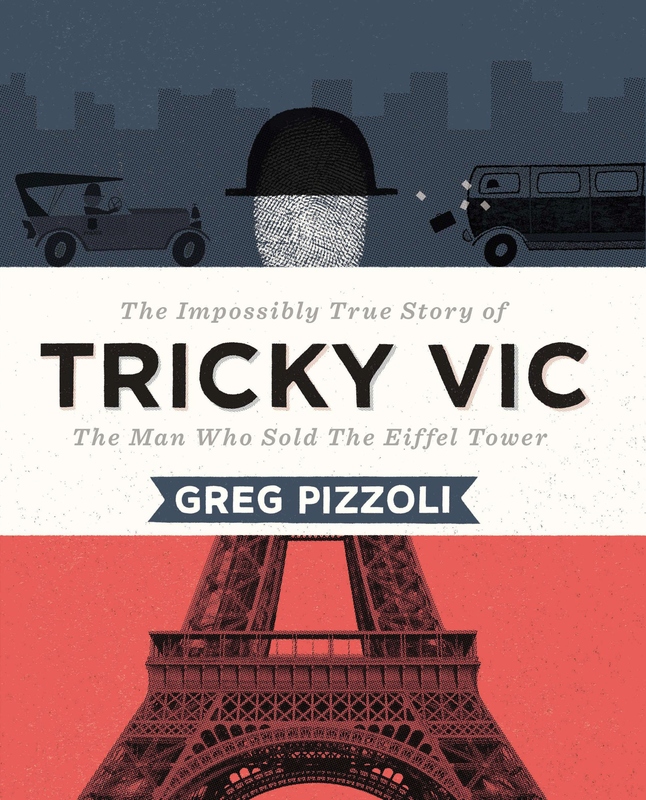 Check out our whole post about this book at our Bookends Blog post for Tricky Vic over at the Booklist Reader. Have you ever wondered whether an octopus could climb a skyscraper? At Wrapped in Foil blog we are featuring a book that will answer that question about octopuses, plus many more. Could an Octopus Climb a Skyscraper? : …and other questions by Camilla de la Bedoyere and illustrated by Aleksei Bitskoff is a factual book dances on the edge of fiction with cartoon illustrations of funny situations. An octopus that can turn yellow and look like a banana? An octopus that washes a car? Hysterical! At its nonfiction core, however, the child will also learn many current facts about octopuses, such as they have three hearts and blue blood. The facts are repeated to reinforce learning in a “fact file” in the back. Could an Octopus Climb a Skyscraper? 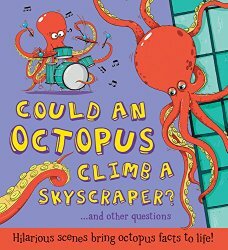 is a perfect choice for reluctant readers, who will be able to relate to the comparisons between octopuses and humans. It will also be a good choice for budding marine biologists, and to accompany a trip to an aquarium. Check our full review for suggestions for related activities. At 272 pages, this has more information about chocolate than anyone could ever want! I liked that this started out with an event with which I was unfamiliar– a campaign by children to keep chocolate bars from rising in price from 5 to 8 cents back in the 1940s. From there, the entire sociopolitical, economic and philosophical history of chocolate is delineated. This makes it great for reference for a report, and since National History Day projects need this kind of complete background, I am considering buying a copy. 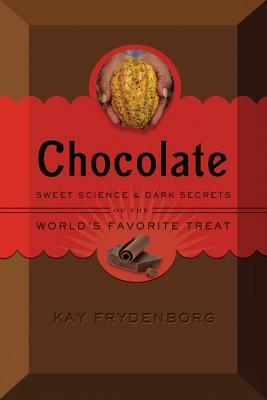 This book has a good amount of pictures, plenty of science facts about chocolate, and is clearly well-researched. Even little known facts, like Hershey’s town in Cuba, are covered. One of the state standards for writing for my students is that they learn to narrow down their topic. While I enjoyed this, I couldn’t help but think that it would have been a better book for the target demographic if the author had decided on a more focused bit of information to present. 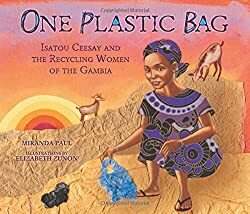 Booktalk: Plastic bags are cheap and easy to use. But what happens when a bag breaks or is no longer needed? In Njau, Gambia, people simply dropped the bags and went on their way. One plastic bag became two. Then ten. Then a hundred. The bags accumulated in ugly heaps alongside roads. Water pooled in them, bringing mosquitoes and disease. Some bags were burned, leaving behind a terrible smell. Some were buried, but they strangled gardens. They killed livestock that tried to eat them. Something had to change. Snippet: Isatou pauses. She and Peggy have an idea. But will their friends this it is crazy? Will the idea even work? Nervously, she explains her plan. One friend agrees to help. The women cut the bags into strips and roll them into spools of plastic thread. Before long, they teach themselves how to crochet with this thread. Locate dung beetles by looking under cow patties or deer droppings but as the author warns, wear gloves, so you don’t get sick from the bacteria that live in dung and wash your hands afterwards. The Peters family lives on a German farm in 1869. They plant flax and weave it into a thread that can be sold for use in clothing and bedding. Unfortunately, times are tough so that they are not making enough money to stay in their current position. Robert, the father, is reading in the newspaper about the availability of land in America. It’s not an easy decision. Leaving Germany means leaving behind their family forever, but the opportunity proves too great to pass up. The Peters save enough money to book passage on a steamship headed for America. The trip is not always comfortable but the family lands safely in New Orleans. From there they take a steamship to St. Louis where members of the German society guide them toward the new railway that will take them to Nebraska. Finally, a ten day wagon trip will take them from Omaha to their plot of over 150 acres in New Steinberg, a community founded by German families. There they cut sod blocks to build a starter home until they can afford to build a wooden home. The Peters settle in and begin working the land. Spin forward to present day New Steinberg where Tom Peters owns his own farm and keeps a picture of his ancestors above the mantle. His daughter Olivia sparks an investigation into their ancestry that leads to a trip back to Germany to find the original Peters home. If you teach about immigration, this book will be a terrific resource. It’s a straight forward account that will teach readers about the pros (acquisition of land) and cons (leaving behind family forever) of immigrating in the 19th century. I really like the focus on transportation as the Peters family encounters several modes as they move from Germany to Nebraska. In the New World will also allow students to contrast the past with the present. This will lead to rich discussions about the hardships families faced in the 19th century. In the New World connects the past and present in a way that will intrigue readers of today. As a student of children’s literature, I probably should have known this beguiling story. 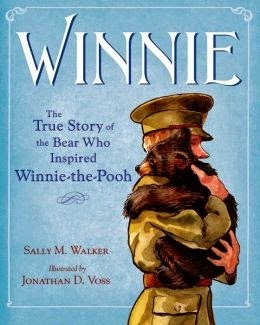 While I did know that the stories were built around Christopher Robin Milne’s stuffed animals and I vaguely recall Winnie having another name, I am thrilled to learn the entire story. Read the review at Proseandkahn.